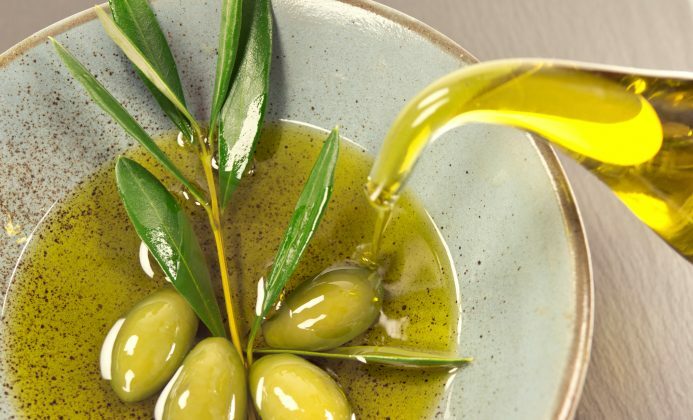 In addition to the healthy Mediterranean diet which is rich in olive oil, the ancient Greeks and Romans used to frequently use olive oil mixed with herbs to clean and moisturize the skin. Nowadays, it is common to see many cosmetic products made from olive oil such as lotions, shampoos, and soap. But there are many more uses for olive oil. Below learn some of olive oil’s great benefits along with a few ideas to try. 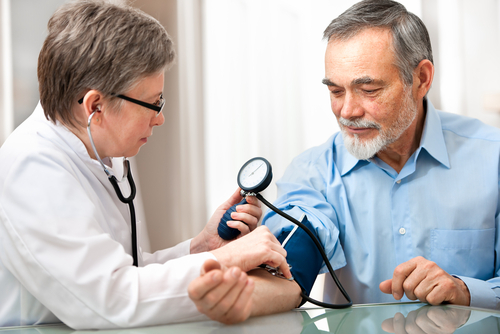 Olive oil is known to lower blood pressure. Researchers recognize this fact, but have yet to be able to pin point exactly how it does so. Studies have indicated that an increased consumption of olive oil can significantly reduce the likelihood of suffering a stroke. Consuming a teaspoon of extra virgin olive oil can soothe your throat and prevent that tickle from making you cough. Wow, what a relief! 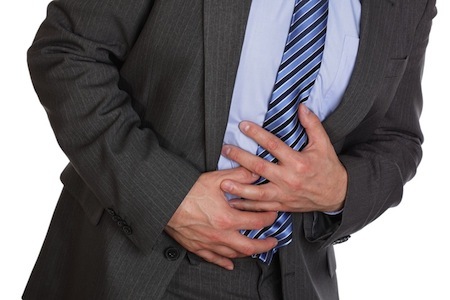 Olive oil can also be used as a laxative. If you’re constipated, consume a couple of teaspoons of extra virgin olive oil. Be sure you’re using extra virgin. If you’re not into consuming it straight (although it can be very tasty), add a light dressing of extra virgin olive oil to a salad. The extra fiber of the greens may help too! Mix equal parts of olive oil and water and apply to areas of the skin that have suffered minor sunburn. It not only alleviates the pain, it helps retain your skin’s moisture too. You know how hard it is to clean paint off your skin. Well, not anymore. Apply some olive oil and rub it into the paint to loosen it. Upon removing the oil, the paint will naturally come off as well. Olive oil contains vitamins E, K, A and D along with phenolic antioxidants and polyphenols. With such properties, olive oil can reduce wrinkles and prevent cell degeneration, or in other words, it slows down the way your skin ages. After washing your face, you can use a small amount of olive oil and gently massage the face. Then, using a hot towel, wipe your face clean. A newborn baby’s skin is very delicate. Applying a small amount of olive oil to your baby’s skin can help protect it. It’s been recommended for diaper rash and baby acne. The effect is not only better than baby oil, it’s also more natural. Olive oil is rich in essential fatty acids. It’s easily absorbed maintaining healthy looking and moist skin. If your skin get a bit dry in winter, pour a little extra virgin olive oil in the palm of your hand, then evenly apply it to your skin. 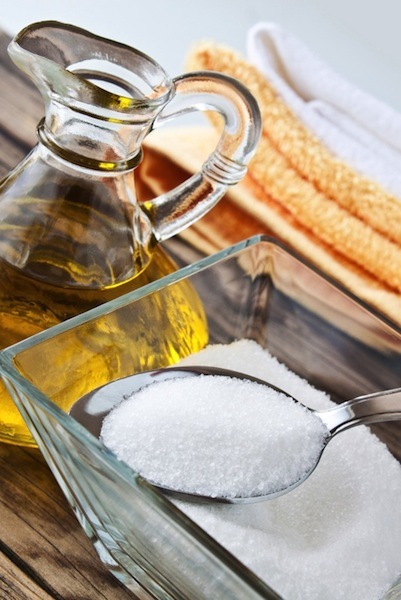 Adding a little bit of salt or sugar with olive oil and gently massaging into your skin is effective for exfoliating. After applying, scrubbing, let it sit for a minute, then rinse off with cold water. Before shampooing your hair, gently massage some olive oil into your hair until fully absorbed. Wrap your hair with a hot towel and wait for 15 minutes. Then, wash your hair with shampoo. After shampooing, you can add a few more drops of olive oil to your hair while it’s still wet. You don’t need to use any additional conditioner. Here’s an interesting one. Do you often use a computer at home? Actually, applying a small amount of olive oil to your face before using the computer can prevent your skin from being harmed by radiation. You don’t need any fancy or expensive oils for a massage. In fact, olive oil may be the oldest massage oil in the world. By incorporating olive oil into your diet you can keep your skin looking healthy. When removing makeup, add a few drops of olive oil on your fingers and gently massage into your skin. With soap, clean off the olive oil which, at the same time, will also take off the makeup. You’ll find your face feeling clean and moisturised. All you have to do is add some olive oil to your hair then comb out the tangles, it’ll be much easier that way. Add roughly 1-2 tsp (5-10 ml) of olive oil to your bath, then gently stir to disperse the oil. An olive oil bath is very luxurious. Taking baths with olive oil over a period of time softens one’s skin. That’s right, you can use olive oil as well for shaving, and it’s completely natural. This is particularly helpful for those with sensitive skin. After slightly dampening a soft cloth with olive oil, wipe it into your furniture for a nice polished finish. The oil will also keep the wood moist and last longer. You may have run out of shoe polish, but don’t worry! 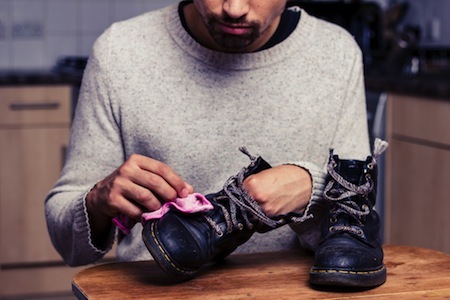 Dampen a soft cloth with olive oil and wipe into your shoes as you would normally when polishing them. Olive Oil Fraud: Is It Really Extra Virgin? Sadly, a high percentage of olive oils are not at all what companies claim they are.